Are you looking for secured VPN? Does your workplace or college or country blocks your freedom to browse the internet services as per your requirement? Are you not happy with the limitations of your internet service provider? Does your workplace restricts shopping sites or social media pages form being accessed in office? Pretty much the same issues are being faced by us as well. That’s how we found one of the most secured VPN service for you to choose. Proxyrack is the solution of your problems. 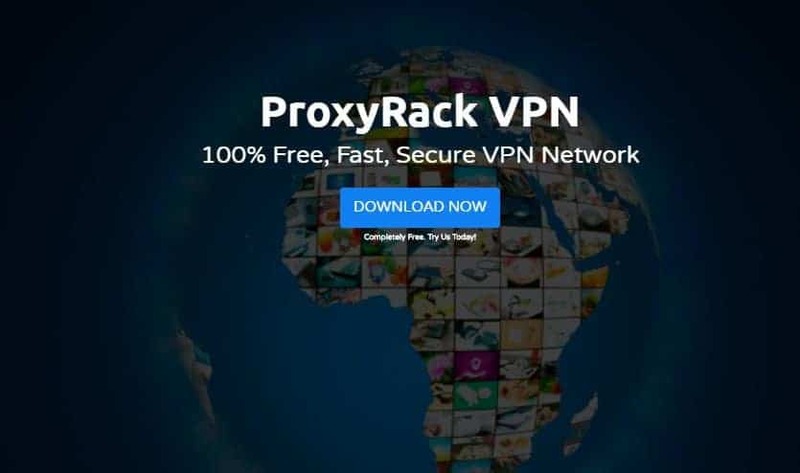 Proxyrack is a free-to-try VPN service, which is an easy to use software with unlimited bandwidth and unlimited server switches by using OpenVPN protocol. It enables the users to access the locked content like audio and video in your workplace, college or in your country. Proxyrack is a fast, reliable and 100% secured network. We had seen many people facing access related problems, country restrictions in using some of the services like Netflix,Pandora, Hulu, etc and in many cases these services are only available to United States. So proxyrack came up with a solution of providing instant access to thousands of private IP addresses; so that you can watch the content on a variety of channels, such as Amazon VOD, Animal Planet, Cartoon Network, Comedy Central, Discovery Channel (Canada and USA), Google Music, HBO Go, Hulu, Marvel, Netflix (Brazil, Canada, France, Ireland, Mexico, Switzerland, UK and USA), Pandora, Showtime, Star Wars, Tou.TV and much more. 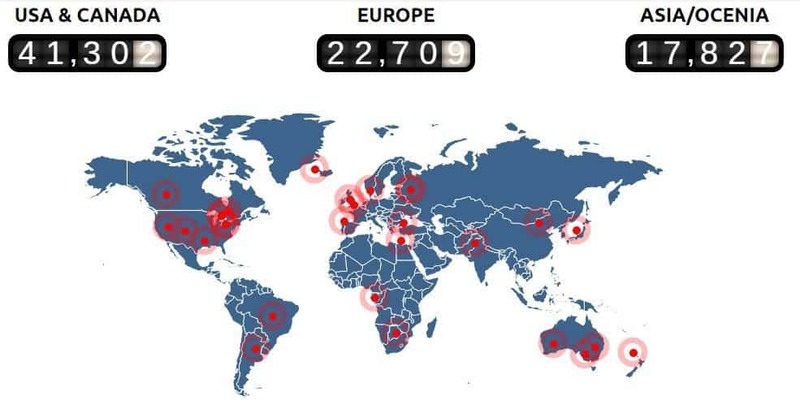 Proxyrack’s IP base is continuously growing and till now it has gathered the repository of over 85000+ IP addresses. All the proxies are routed via Central Access Point allowing users to use IP addresses from 40+ countries including USA, Australia, Russia, India, Europe, United Kingdom, etc. Proxyrack offers the multi tasking and All platform ready features, which enables the users to stream content with complete freedom in any devices you need. You can watch the US Netflix content, the UK version of BBC or Canadian version and your girlfriend can listen to France Netflix on her Mac while your father can watch Pandora on his iPad. It is compatible with all the devices available from Windows to Android (web compatible). This enables you to get flawless performance and total access to the content you want, no matter what you’re running it on. Experience freedom on a whole new scale! Proxyrack employs cutting-edge algorithms that establish high-speed Direct Connections to any website imaginable and you’ll enjoy absolutely ZERO speed loss, avoiding any sort of middle-man stealing a piece of the action. With the help of the large number of proxies, ProxyRack provides some of the fastest and high-quality IP addresses. This is helpful for anyone who runs multiple connections at the same time. Proxyrack automatically accepts all protocols including HTTP, HTTPS, SOCKS4, SOCKS4a and SOCKS5. Thus even for secured servers, proxyrack can help you browse the website without any hassles. Proxyrack provides an easy access to two different systems, the 1st one allowing to connect through a single IP:PORT combination while assigning a fresh IP for each new connection. In the 2nd system the connection is done via ports which automatically rotates after every 10 minutes. So, basically, in 1st system IP is switched with every new connection & in 2nd system IP is switched after every 10minutes. This makes sure that the connection is totally secured and masked. Proxyrack gives an access to more than 250+ IP:PORT combinations and an additional access to the entire 85000+ IP network. The possibility to test the capacity & dependability of the proxies without paying any charge is commendable. Proxyrack proxy provider offers a 7-day free trial so the users can check whether the provided proxies by the software is able to give them an access to their required websites/services. 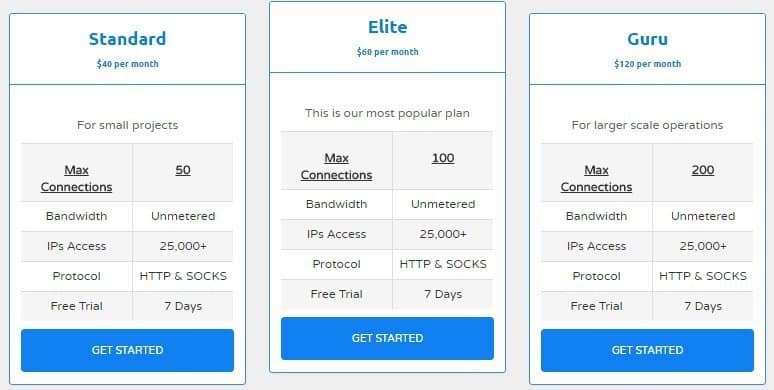 After 7 days of free-trial their pricing is based on your requirement of the maximum connections (threads) you want to make through their servers. The higher the “Max Connections” you have, the more jobs / web requests you can complete in a shorter span of time. The payments include PayPal and Credit Card. If in case in 7 days Trail period you don’t like the software, you can claim refund with the additional 7 days grace period on “No Questions Asked” basis. Proxyrack offers the highly secured DNS servers that protects your privacy and block unwanted spam through our TripleSafe service. Have you ever misspelled a domain name, only to be redirected to your ISP’s website and bombarded with spammy ads? That’s a nasty little trick called DNS poisoning, and we aren’t having any of that here! The technology in proxy rack will avoid all DNS poisoning, replacing spam and ad pages with the old-fashioned “Browser Cannot Find the Page” message. Relax knowing that your browsing is safe and secure, entirely in your control, and with your sensitive data far from prying eyes. I bet you will enjoy the proxyrack in watching the blocked content (channels) in your country! Try out the proxyrack for 7 days for completely free. If you like there services then upgrade it. The IPs provided by ProxyRack are highly suggested for new account creation and ranking requests. We upgraded to premium plan and enjoy all there services for free completely. This VPN is a special one and you can use this on some places (websites) where you’re not allowed to use the DNS. Note: Don’t worry about the bandwidth and speed issue! everything is dedicated and fast in the premium plan. What you waiting for ? Go now and sign up for a free account and enjoy 7 days of proxyrack! How to transfer any file from Windows PC to iPhone without iTunes?